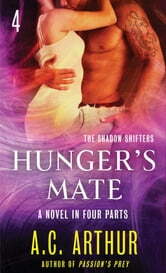 Part Four-the breathtaking conclusion to A.C. Arthur's HUNGER'S MATE (Shadow Shifters)! In Hunger's Mate: Part 4, Jewel has always had her own agenda. But when Ezra discovers how far she's gone-sleeping with the enemy to achieve her means-he has no choice but to ask himself: Can he trust her with his own secrets? Instinct tells him that he must be near her. She is the one who can satisfy his hunger. But will his passion for her mean the destruction of him and his kind? How far will one Shadow Shifter go as he follows his own heart? Read all four parts of this sensational novel-and look for the full volume of HUNGER'S MATE in February 2015 from St. Martin's Paperbacks.